Here at First Choice Finance, our 25 years in the industry has taught us many things, most notably that no two customers ever come to us with exactly the same situation. This means that what could be a great option for one person might not be the right decision for another. Mortgages and homeowner secured loans can be a good route to finance with more flexibility in terms of amounts and loan terms, but that doesn`t mean they are right for everybody. There are other ways to access money and raise finance. Through First Choice Finance you can gain access to some very competitive unsecured loan rates and products & critically any quotations for your loan will be provided for free and without any obligation. An unsecured loan is a loan that is generally issued by a lender relying on it being supported by the borrower`s creditworthiness. Not by using something as collateral or security, like a car in the case of higher purchase agreements, or property as you would for a secured loan or a mortgage. As a result of this, they generally require that you have a cleaner credit history, because they have no other means of verifying your intentions of paying back the loan. That does not mean that having adverse credit is a definite no for an unsecured loan, it may well mean that you will have less options, be able to borrow less and the interest rate offered will normally be higher. This is because the lenders that choose to exist in this market may believe they are taking a bigger risk lending on an unsecured loan than say a remortgage, or secured loan because they have no security if for any reason the loan isn`t paid back. They are lending the money based on your previous credit history, in that to a degree if you have managed to consistently pay bills and other outstanding debts in the past, there is reason to believe you would continue to do so. Unfortunately this greater risk involved for a lending company also may mean that the interest rates you are faced with are often higher than if you were to raise the finance with a mortgage for example. That doesn`t mean that unsecured loans shouldn`t be considered when looking to raise finance, they can provide a flexible and efficient way to borrow from £500 to £10,000 over a shorter period of time of 1 year to around 5 years. They also can have much lower interest rates than credit cards that could provide a similar form of lending. The key is achieve your finance needs by borrowing an amount you can afford and what you need to complete the task you need the money for. Here at First Choice we can provide access to many different solutions for unsecured loans so give us a call on the above number and let us see what we can offer you. One of the great advantages of an unsecured loan, besides the fact that no security is required, is that the timescale from applying for your loan to getting the money in your back pocket to spend on what you want is much shorter than it would be for a secured loan. Through our experience in the market we can see that this is a huge contributing factor for people looking for smaller personal loans, if say your car has broken down, you need the money to get it back on the road. Having the money in a few weeks possibly isn`t going to cut it. We understand that need, which is why we like to speed the process up even more by giving you rapid access to multiple unsecured lenders. The First Choice Finance simple and easy application process begins either right here on our website by filling in our short form or by calling our offices on 0800 298 3000 (landline) or on 0333 0031505 (from a mobile). It doesn`t matter if you are a tenant or a homeowner all you need to be is 18 years of age or above and be looking to raise finance for the right reasons. One call or a short loan application online will get the ball rolling. Once filled in our team can set to work finding you the loan you want by having the information you provide to hand. In no time at all, through First Choice you can gain access to the right people so that you have the money to spend on what you need, when you need it. We understand the importance of providing our clients with the best deals out there and if you have good cashflow, no credit issues and want to raise from a few hundred pounds to perhaps as much as £10,000 then a good credit unsecured loan could well be your solution. Unsecured loans are also available to both homeowners and tenants alike which can be very attractive to some of our customers, especially those that might not be able to raise finance another way. First Choice has been getting funds for our customers for around 25 years, so our service also includes offering our clients options that they might not have first thought possible. If you have a good or even fair credit history then we can provide you with access to some of the very best deals on the market for secured loans to obtain from £3,000 to £100,000 for virtually any purpose. If you are a homeowner with a few credit problems right now or in the last few years, unfortunately giving you a bad credit history then we may well still have options for you through homeowner secured loan plans or remortgage lending solutions, which are still competitive. We want to make sure our clients explore all of their options and if you are a homeowner and have not managed to get what you require in terms of raising money, then an unsecured loan isn`t the only one available to you. 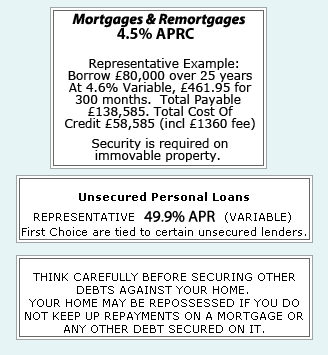 Both an any purpose homeowner loan or a remortgage could see you raising what is required. If you want to consider these options in more detail, then talk to our helpful and considerate team to get a free, no obligation quote. Fill in our short enquiry form on line or give us a call. Building up bad credit can happen for a number of reasons, often through very little fault of your own. Having bad credit, shouldn`t mean that you no longer have a route to raising some money for a valid reason. We understand this, which is why we have developed access to key lending solutions, so that as far as possible, through our experienced relationships anybody even in complex circumstances has a chance to get access to decent loan plans. In some cases, if you have been unlucky enough to have fallen on particularly bad times and you have numerous CCJs, defaults or mortgage arrears you may not qualify for a regular unsecured loan. 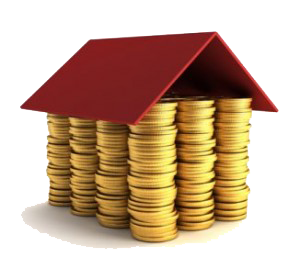 Lender`s need to ensure that the loan will be repaid in full and a previous poor credit history could suggest that this might not be the case. Your credit history may represent your past but it doesn`t have to dictate your future and you can look through us to access unsecured loans that require no credit check at all. These unsecured loans are often referred to as guarantor loans whereby another person, normally a family member or close friend, offers to act as the lender`s guarantee for payment. For more information please head over to our page on guarantor loans. If you are ready to put the cogs in motion then fill in our short online enquiry form and one of our team will get back to you, or give us a call. If you are looking at borrowing a larger amount you may consider taking out a secured loan, with loan amounts up to £100,000 over a maximum loan term of 25 years, you could use a long term secured loan to raise money for almost any purpose.